The Saints took the lead after only seven minutes when Steven Davis reacted quickest to the loose ball, after James Ward-Prowse's excellent free-kick came off the angle of post and bar. Defender Shane Duffy came close to equalising for the Seagulls with a header before the home side drew level on 52 minutes, when 34-year-old Murray nodded in from Pascal Gross' cross. Bar the two goals, neither goalkeeper was severely tested. 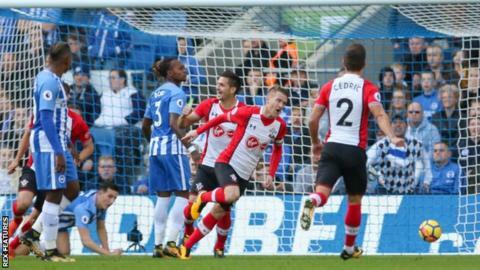 Saints' midfielder Dusan Tadic saw his strike deflected wide and striker Manolo Gabbiadini was denied by a sliding block from defender Lewis Dunk. The point moves Southampton to ninth in the Premier League table with 13 points, and Brighton go up one place to 11th with 12 points. Do Southampton need shooting practice? Manager Mauricio Pellegrino will likely be satisfied with his side's top-10 position in the table, but profligacy in front of goal might have cost his Saints a few more positions. As it stands, they have scored the second fewest number of goals (nine) among teams in the top half, but are joint-fifth out of all 20 teams when it comes to efforts on goal (147). Former Napoli forward Gabbiadini is the club's top scorer this season with three goals, but also the most wasteful (13 chances). That 13th effort on goal came after Saints had equalised, when his first-time shot from Ryan Bertrand's low cross was brilliantly blocked by Dunk. Midfielder Tadic is another player who gets into the right place at the right time, but he now has a conversion rate of one goal from 11 chances. His one opportunity at Amex Stadium came just before the break, when his strike from Sofiane Boufal's cross was deflected over the bar. Pellegrino might want to use November's international break for some shooting practice. In contrast, Brighton are a lowly 14th when it comes to chances created (97) in the league this season, but have scored 10 goals. Those statistics might improve further if Murray and Gross continue their good form. The German midfielder, who was the supplier for one of the striker's two goals in the 3-0 win over West Ham, delivered another brilliant ball from the wing for his team-mate, who nodded in at the far post. Gross, who joined from Ingolstadt in the summer, now has five assists in the league so far - only Manchester City midfielders David Silva and Kevin De Bruyne (six) have more. Brighton boss Chris Hughton, talking to Match of the Day: "I was pleased with the response, When you concede early, the last time we did that at Leicester, we came away with nothing. We got stronger as the game opened up. Southampton are a good technical side. When you go behind early you are just glad to come back. "These are a good side with good quality. We got back into the game and showed good quality. In the final third we had more opportunities to create and thoroughly deserved to be back into it. "In all our games there isn't anybody who has given us a real beating. We have been in most games." Southampton manager Mauricio Pellegrino: "It was a game that was really tight. Neither team could completely control the game. "High tempo, up and down but we never controlled it totally, the ball, and create more action. Both teams were compact. My players competed well. "I think it is a season with ups and downs. In terms of results we deserved a few more points but our league is close between 10 and 12 teams from the bottom until around sixth. We are in this group." Southampton have won just four of their last 18 Premier League matches (W4 D7 L7). Murray has scored as many Premier League goals in his last two appearances (three) as he did in his previous 28 PL apps combined (three). Gross has been involved in seven of Brighton's 10 Premier League goals this season (two goals, five assists). Gross has already assisted more league goals this season (five) than he did in both 2016-17 and 2015-16 (both four) for FC Ingolstadt 04 in the Bundesliga. This is the second time this season that Steven Davis has scored from the first shot on target in a Premier League game - he also did this versus Crystal Palace in September. Harry Kane is the only other player to have done this on two occasions this season. Brighton are away at Swansea and Southampton are at home to Burnley next Saturday (15:00 GMT). Match ends, Brighton and Hove Albion 1, Southampton 1. Second Half ends, Brighton and Hove Albion 1, Southampton 1. Gaëtan Bong (Brighton and Hove Albion) is shown the yellow card for a bad foul. Corner, Southampton. Conceded by Gaëtan Bong. Substitution, Southampton. Pierre-Emile Højbjerg replaces James Ward-Prowse. Attempt missed. Anthony Knockaert (Brighton and Hove Albion) left footed shot from outside the box is high and wide to the left. Assisted by Pascal Groß. Attempt blocked. José Izquierdo (Brighton and Hove Albion) right footed shot from the left side of the box is blocked. Assisted by Davy Pröpper. Corner, Southampton. Conceded by Lewis Dunk. Attempt blocked. Manolo Gabbiadini (Southampton) left footed shot from the left side of the six yard box is blocked. Assisted by Ryan Bertrand with a cross. Corner, Brighton and Hove Albion. Conceded by Wesley Hoedt. Wesley Hoedt (Southampton) is shown the yellow card. Wesley Hoedt (Southampton) wins a free kick in the attacking half. Attempt missed. Glenn Murray (Brighton and Hove Albion) right footed shot from the right side of the six yard box is high and wide to the right. Assisted by Pascal Groß with a cross. Attempt blocked. Ryan Bertrand (Southampton) left footed shot from outside the box is blocked. Assisted by Steven Davis. Corner, Southampton. Conceded by José Izquierdo. Goal! Brighton and Hove Albion 1, Southampton 1. Glenn Murray (Brighton and Hove Albion) header from the centre of the box to the top left corner. Assisted by Pascal Groß with a cross. Attempt missed. Sofiane Boufal (Southampton) left footed shot from outside the box misses to the right following a corner.